I made a post at the DOTS ... thread (in reply to a post referring to the Jewish Calendar) and the post I made goes into long term cycles that operate strongly in the markets covered by Setup For The Big Trade. 1st August this year? I expect the 9th of Av "tendency for ill winds blowing" fell on 29th July instead. If occasionally 9 Av sees a catastrophe, and most years it does not, then a question arises as to what other thing occurs on some 9th of Avs so as to trigger the potential for dire events of that time. And of course this coincidence of 9 Av and something else does not happen every year. it's interesting, also, that the tribes were in thedesert and on 9 Av some of them decided to not invade the promised lands. And the story goes, that those who doubted their god incurred his wrath and had to wander in the desert for 40 years , which happens to be 38 years extra. Well 38 years is almost 39 years, depending upon what time of year you start counting and what part of year you end your count. And 19 years is the Metonic cycle, during which the sun, moon, and earth return to their original positions exactly, in respect to each other. So ... two Metonic cycles later, those Jews in that proto historic biblical story got to enter into Canaan. This is interesting because the 9 Av is a Hebrew Calendar date, different from the Gregorian calendar we use today. But being based on the Lunar month, not a 28, 30, 31 day month, it counts Lunar months. And naturally after every Metonic cycle the big event is at it's same interval as the sub period was the previous Metonic cycle. Are you aware that the Metonic period is also the period after which the Eclipse cycle repeats? The Babylonians used it in conjunction with their historical records to predict eclipses. And eclipses where when the god, the light in the heavens that makes all things grow and looks down upon us all, went away unexpectedly, which was construed as a very bad thing. So eclipses, and lunar 29.5 day months, and 19 years and 38 years are all tied together in this 9th of Av matter. They were two Metonic cycles in the desert if the story is true. And that's interesting in itself, because the ratio between any Fibonacci number and the Fibonacci number two places lower on the series is 38.2%. And since 19 years is ... well 19 years long ... it can accommodate an eleven year cycle and an eight year cycle within it. So every 38 years you would have two 11s and two 8s. But interestingly, a pair of those elevens takes you very close to the 22 1/2 year solar cycle, which is reflected in summer and winter warmth. That would be important for a tribe living in a desert I think, if they could figure it out. And those early Jewish priests and scribes were good at their Kabbalistic mathematics, having brought a great number of ideas from Babylon. We have other stories about how some of their number managed to predict famines and plentiful years in advance, achieving great wealth and power in the process. Gold told those people, and I often wonder if that was the bright light up in the heavens that is referred to, because, I always remember that Metonic cycle is composed of three in one, I mean the Earth, the moon and the sun, and one in three. Three is also an important number in the bible. This is why I think that is so. It's all so long ago. It's been told and retold verbally, and written in scrolls, wwhich were copied onto other scrolls later with minor differences, some scrolls kept and others thrown out, and translated, and edited. And even more important to observe, it's all encoded so as to hide the true meaning of the things being discussed, by wrapping everyday simple-life-in-the-desert storylines around the maths and the important numbers mainly so the gentiles wouldn't get it. Spread the goodness around, or not. Not everybody is a friend. By the way gentle folks. 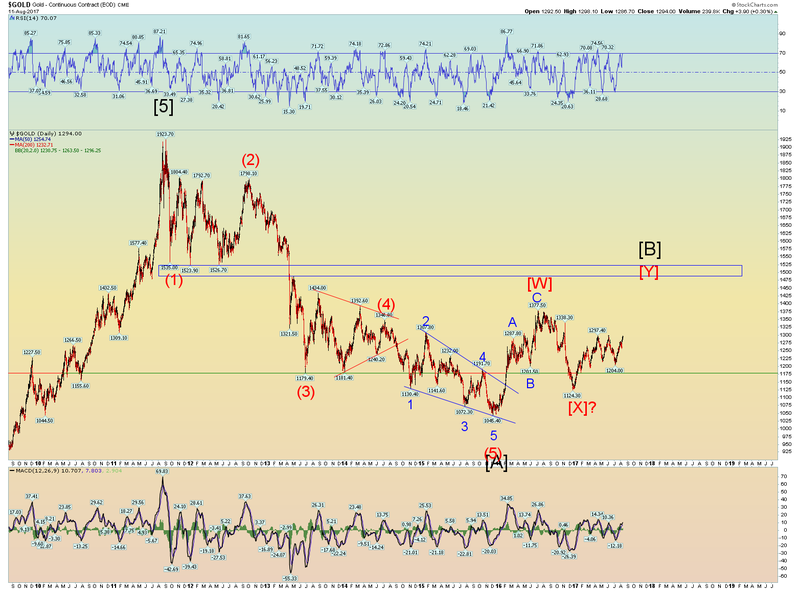 How long was gold going up in the bull from the 2000 low, and how long has the bear been since the 2011 peak? It seems to be an off topic thing to bring up, given the context in which you made your post in reference to biblical catastrophes recurring on 9th Av, but I just thought I'd mention it. In case you have read the above, and think those time periods I mentioned are not applicable to the price of gold, in the modern day Comex Exchange, after the input of the powerful and shadowy players have been fully exerted upon trading, think again. The major low for gold in 1976 was followed by the next huge double bottom low at 1999 which was 23 years later. that was a double bottom low in 1999 and 2001. Let's pick a middle date for the bottom and say 2000. Eight years later was the interim (on a monthly basis) high at Jan 2008, followed by a buying point. Then the bull resumed to make top in July 2011 which was eleven years after the bottom at 1999/2000/2001. Let's go back to the 1980s, but look at the top. That was at 961.60 in Jan 1980. The last high of that giant trading range was 1999, nineteen years after. If we move 23 years from the top into the future, as it was the future then, that takes us to 2003. This was missed by one month as I will explain now. The price of gold made its high for the month at Feb 1996 at 508.20, then began the final downswing of the bear, which involved a major breakdown in 1997. This Feb 1996 high was taken out Jan 2004 eight years later. The breakdown was replaced by a breakthrough the 1996 top to the upside on Jan 2004, eight years after. The 1976 low and the 2000 bottom can be bisected by a major high in 1987, which is 11+ years after 1976 and 11+ years prior to the 1999 low and 11+ years from that to the 2011 top. There is a lot of reading and re-reading in the above paragraph. Some might get a BIG chart out and work it through a few times. So if I then the top at Q3 2011, and add 5, 8, 11.5, 19, 23 years - are there any dates coming up in the near future that might be worth paying special attention to? Those years would be 2016 (Dec 2015 being the major low for the bear, or the bear to date) 2019, 2019 again, 2022-3 and I'll stop there. Off the charts analysis, soon to be on them. While we are on alternative calendars, here's a heads up on another HebCal event coming up: Yom Kippur 2017 is 30 September. Those who have read Christopher Carolan's book The Spiral Calendar as I recommended in a past Setup post will know this sometimes matters for stocks. It refers to the possibility and timing or September or October surprises in the stock market. I will try to take a look at the cmegroup tool, but with a wife, kids, and day job it will not happen soon. Still, I appreciate your interest in the bottom fan. I also think this run has the potential to get to 1400 by the end of the year. 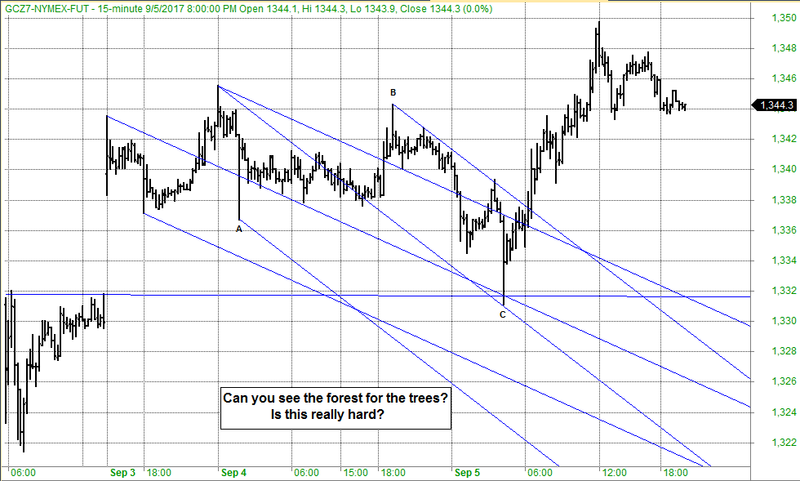 A nice complete picture would have this wave 3 challenge the old 1377 high, wave 4 pullback, then wave 5 to 1400. Then again I'm trying not to be too bull headed...if you know what I mean. How often is a gap in the lead gold contract unfilled? Almost never as far as I can see. Neither do I like the look of the holiday trade bar, with close higher than open, after a gap up. I'm betting that the gap will be closed, and then look out to the upside. So far, the short is working out, slowly. This fork uses the min-2 daily pivots and appears to describe the advance well. Logged in just to hat tip the filled gap. Cheers. maybe the potential is still there, Papua New Guinea isn't my favorite country at the moment. Jumped out last week. Two oligarchs stepped in and diluted the crap out of the company, no major potential midterm. I am out! September 23 2017 Revelation 12 Sign l The Blood Moon Tetrad and Augst Eclipse points at the Sign! Framed by Argentus GV dates of 21,22 - 24-26. Maybe Virgo needs a little bit of calmness during her childbirth? Gold gap filled and Andrews lines. OMG. I have been blind. Notice the additional line on the 15m chart. (This same line does not work on the 60m.) Price actually misses that 0 ml A-B by a tick. Very nice 5p c wave. With advance warning indicator at p4... OMG, the 1-3 descending bottom line of the c wave is touched at the low (not drawn, just seen). Price today reached the UH of the daily min-2 chart posted earlier (how the channel seemed to be working to define the larger movement) and has been declining since...Price exceeded that value by (only) 5 ticks. Treasuries will come under stress as an inflection bites during the coming fortnight. 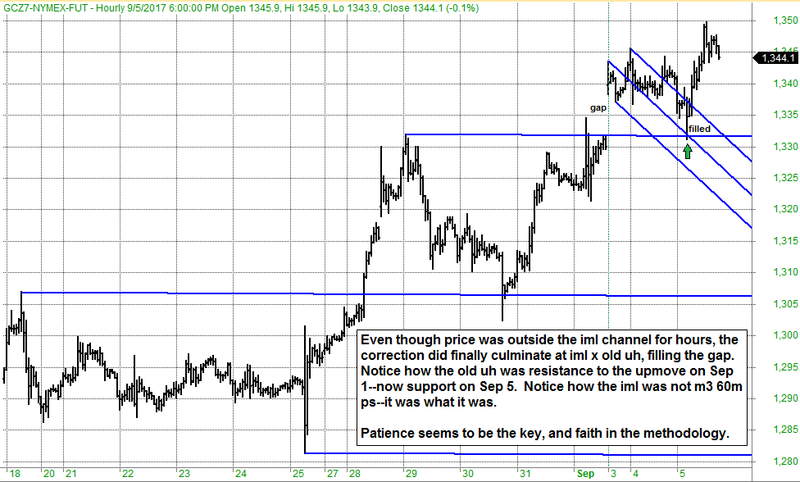 The above channels suggest a mid-range support being tested at the moment. A break at inflection would create a pivot which could provoke a retest of the channel bottom, but only if the mid-range is taken out. There is a cycle inversion visible in this chart. 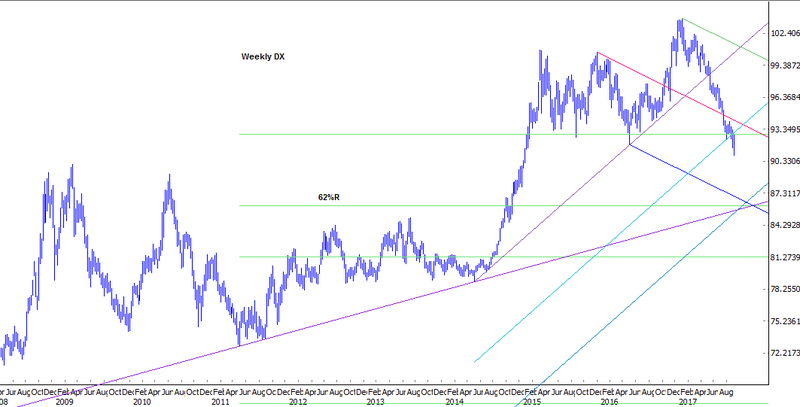 The price (yield) low in August 2016 timed at the harmonic projection high. So since then, US yields have arrived at the following pivot forecast of this projection. The robust projection, in red, is about passed by now, and the more sensitive but less reliable projection in light blue places this inflection or pivot, a couple of weeks later. Note that at the 2016 inversion (early 2016) the sensitive projection predicted a vertical dive during the cycle high period, and there was indeed a tad afterwards a mid-top-structure spiky downwards move in yields, which was an upwards spike in bond prices. I left the vertical cursor line proximate to the approaching important period so that the date can be seen. Never forget the inversion is temporary, and the cycle which went from 2013 to 2015, 2+ years duration, has run at half interval for almost 2 years by now, in a situation whereby it's half sized sub cycle is dominant. Shorter cycles taking over is often a reversal pattern signal, and this is a large, long term formation. Tips and gold spreads are worth watching from here onwards. They both track inflation, but the spread shows erosion of confidence in the sovereign. Turns out the cmegroup tool is the same on goldprice.org Here is current picture with FesterFans. Maybe this is the non-deflation, hyperinflation scenario playing out? and last but not least, a stunning chart that is almost frightening to me even though I am betting against it big time. This will end very badly for a lot of people, so sad! Don't forget the Fibo retracements from the 2011 high: 1375, 1475, 1575 could all be final targets for this B wave correction. And 1575 would fill that gap from 2013. Just bought a small position in Genesis Metals and Nexus Gold. First Majestic and Yamana were almost 25% of my portfolio so I had to shave off a couple of %. Nice development in McEwen, Leagold and Defiance silver as well. No more than 7-8% in one single miner, and no more than 4-5% in an explorer these are the rules of the Solsson 21miner index. Took some profit and tightening stops. I think this 3 of 3 wave can challenge last years high but I don't want to be too bull headed. 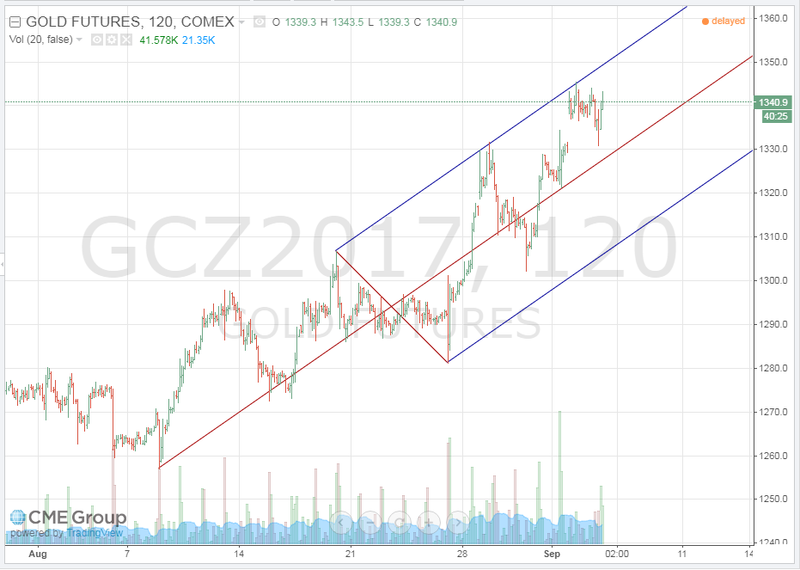 Thanks for the chart from goldprice.org--but could you please show me the method? i.e. what range (& is it defined or fitted?) do you select to fib-divide, and from where (& is this origin defined or fitted?) do you draw your fan lines? Congratulations on price reaching and turning on Friday from the trendline projection that you pointed out a week or so ago, the one that I said was the same as the sliding parallel in Andrews-speak. There are many reasons to think that Friday was a top of some consequence. Whether it will be a major pivot or just a larger minor pivot I don't know--but the sliding parallel to a monthly major ML must be considered as major or nearly so. What are the reasons to think price has reached some degree of peak? See here for the chart reference. 1) price reached a (nearly?) major line, the sliding parallel, and put in a daily reversal bar (rb) by EOD close [but not the settlement too, so it's a weaker argument]; 2) there is a daily volume reversal signal; 3) price finished the week under the Trump Top of Nov 2016 after intraday higher Thursday and Friday, and it could not settle above it all week; 4) RSI(14) shows divergence at the two up EOD closes last week (momentum waning); 5) RSI(14) reached 76.60--the highest in over a year, and is overbought [which I think portends a new high after some correction]; 6) price closely approached 1.62% exR of last major pivot downswing, a natural resistance/target; 6) daily RSI(15) on Friday closed under the 5-period moving average of RSI(15), which signals a change in trend when price has reached a major line. So where will it correct to? Too soon to tell (assuming it does correct...) but the ML from the May low is a natural target and support for continuation higher, often to its far H.
My bullish hope for the future is that price reaches the Far H to the big ML on this chart...ooh la la (over 1500) and my miners wake up and shine. PS here's my current view of the DX. 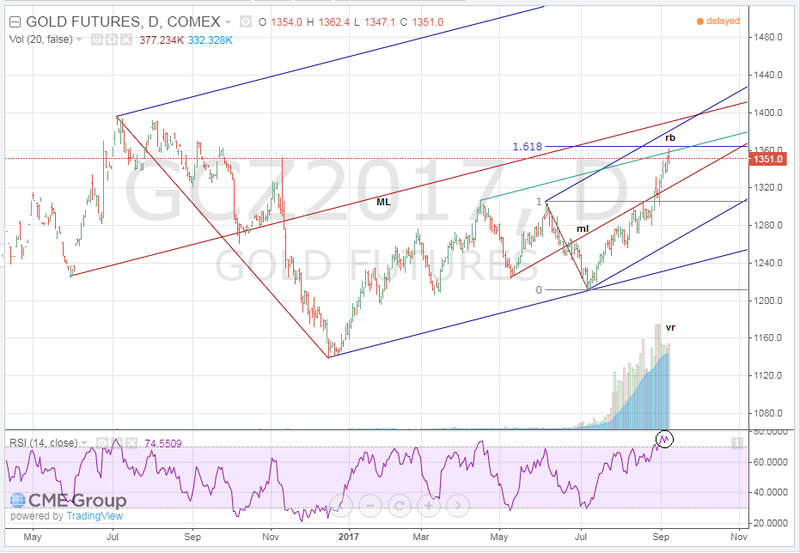 Likely supportive of higher gold prices. Three of my miners, time to take profits? "For the dollar bulls, the metals and mining bears and the precious metals sector bears … there is a light in the tunnel … its a freight train coming right at them". I am excited as hell here, feeling the trader andrenaline pumping, so why is this thread so silent? This has become the AM-Pete-Uncle Fester-Solsson thread ... why? The Silver and Gold3000 nicks are gone and so are all others ivars, redwood, fslade, JazzTalker, foscotanner, Green Latern, Kid Salami, eclectic etc. etc.